Christianity, and its underpinning imagery, contains a lot of water. We have the waters of baptism and the streams of living water flowing from the Heart of Jesus, whilst throughout the scriptures water is, literally, the very stuff of life, without which we cannot flourish. Water cleanses, heals, enables life and growth, satisfies our thirst and increases our wellbeing. With joy we draw water from the wells of salvation (Isaiah 12) - and our joy is precisely because that pure, clean water is there, in abundance, for our health and nourishment. And today, feast of Our Lady of Lourdes, we are reminded again of water's positive properties, of how it can cleanse and heal and nurture life. The first reading speaks in glowing terms of peace like a flowing river... the wealth of the nations like an overflowing stream... evoking images of water as beautiful and a blessing, even when over-abundant - which is how it must feel in the arid places which gave birth to so much of our scriptures. Those arid places still exist in so many parts of the world, where people die for lack of clean water and crops suffer or die for lack of rain. Currently, though, water is having a pretty bad press in the UK: there's way too much of it, in all the wrong places, filled with dirt and disaster. The massive waves battering the south coast are dangerous and destructive, the floods in Somerset and elsewhere bring mud and misery into peoples' homes and livelihoods and the constant rain feels relentless, not refreshing. Every night the TV shows us images of people in despair, livestock in fear and a constant, round-the-clock battle to pump away an ever-increasing tide of water. Peace, for them, is most definitely not a flowing river, and prosperity does not lie in overflowing streams. 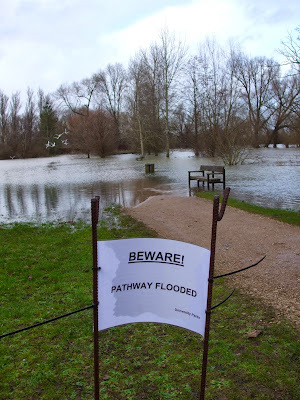 Here in Oxford, where flooding has been far less severe, we've just finished four mostly dry days (though with night-time rain and some heavy showers interspersed with bursts of sunshine). It's been cold and mostly grey, but during those four days there was a general sense of reprieve, as though nature had called a ceasefire, even though the ground has become so saturated that the flooded river waters have not receded at all. Today, therefore, is a good day to pray especially to Our Lady of Lourdes: not only for all those who lack the blessing of rain and water, but especially for all those whose homes and livelihoods are being devastated by flowing rivers and overflowing streams.